Jeff Kuhner from the Washington Times, calls for the Immediate Impeachment of Obama. This is way overdue, and someone should have asked these questions months if not a year or two ago. If we would have had information, that is locked away, hidden in secret files, by the Obama administration, we would never have elected this pathologic liar. He is slowly - piece by painful piece - erecting a socialist dictatorship. We are not there - yet. But he is putting America on that dangerous path. He is undermining our constitutional system of checks and balances; subverting democratic procedures and the rule of law; presiding over a corrupt, gangster regime; and assaulting the very pillars of traditional capitalism. Like Venezuela's leftist strongman, Hugo Chavez, Mr. Obama is bent on imposing a revolution from above - one that is polarizing America along racial, political and ideological lines. Mr. Obama is the most divisive president since Richard Nixon. His policies are Balkanizing the country. It's time for him to go. To Boldly CUT Where no Pizza Cutter Has Gone Before! 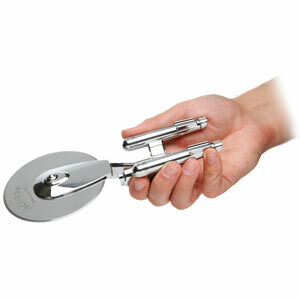 Thats right, it is the Star Trek pizza cutter from Think Geek. For the Trekkie or Trekker who has everything, comes another prized collectible. But this time it is almost as handy as a real phaser. This one cuts pizza pies! MacWorld has a MacOSX Hint, to allow you to restore the old iTunes interface on the Mac, to iTunes 10. For iTunes 10, Apple took the three colorized buttons in the top left corner, and turned them sideways. It seems backwards and non-unifying compared to all other Mac Windows. If you want it the old way, try this tip. There is a very nice Mac utility available, called MacPilot. This utility allows you to set hidden features deep within the Mac OS, and various application settings. Many of these settings can be done by manual entries, but the ease of use, and attractive interface deserves a 2nd look. I really like this tool, which I purchased via an Internet bundle. I have a few auctions for two of my wife's very fine Purses, online. One is a Purple Coach Purse, and another is a Black Tignanello Leather Purse. Both are great finds in very good used condition. Take a look!